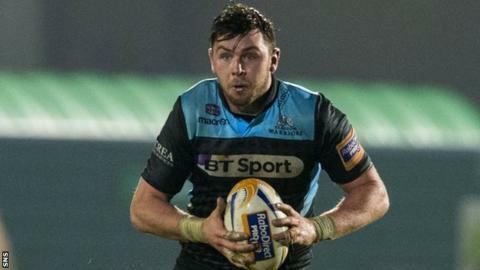 Back-row duo Ryan Wilson and James Eddie have secured contract extensions with Glasgow Warriors. Scotland loose forward Wilson, 24, has agreed a new two-year deal, while flanker Eddie, 28, will stay on for at least another 12 months. Back-row colleagues Rob Harley and Tyrone Holmes agreed new deals at Scotstoun last week. Coach Gregor Townsend said: "We always look to re-sign players we believe can drive us on to become a better side." Warriors are chasing a top-four finish and a place in the Pro12 play-offs and Townsend thinks the latest signings will ensure depth in the back-row next season. "Ryan and James will have big roles to play in our future," he said. "Ryan has improved every year since he's been at the club and is one of the most skilful back-row players in the game. "James is very popular within the squad and he's had an excellent season so far. "He works very hard to improve himself and has made a big impact in a number of games this season. "He has also played very well for Scotland 7s this year and was a key player for us when we won the Melrose 7s." Wilson has spent four years with Warriors and, having made his Scotland debut last year against Wales, believes playing for Glasgow has helped him accumulate his nine caps. "Playing for the Warriors has given me the opportunity to go on and play for Scotland and I'm really enjoying my rugby just now," he said. "There is a great atmosphere around the club and there is huge strength in depth within the squad." Eddie has already been with Glasgow for nine years and is delighted to have extended his stay with his hometown club. "We've got a really competitive squad and my ambition is to win a major trophy with the Warriors," he said. "I love being part of the club and I'm very excited about the direction it's heading in."